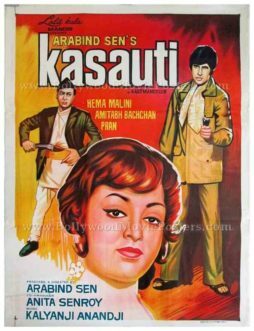 Old handmade Bollywood poster of the Hindi film Kasauti (1974) for sale. This is an actual surviving vintage movie poster of the 1974 Bollywood film that featured the greatest superstar of Bollywood, Amitabh Bachchan in the lead role opposite Dreamgirl Hema Malini. Printed and circulated a few years after the first release of the film (somewhere in the late 1970s), this handmade Bollywood poster was printed for publicity of the film but never ended up being used. This poster was originally designed on a hand drawn canvas by a small time art studio, making it very collectible. The poster features a large hand drawn close up portrait of Dreamgirl Hema Malini. Superstar Amitabh Bachchan is depicted holding a gun at the back, whereas Pran is seen holding a Nepali Khukuri or a machete styled knife. 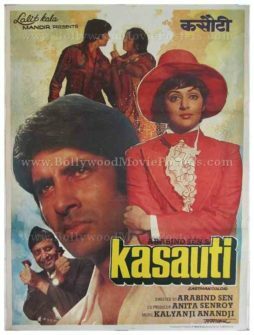 Kasauti is a 1974 Bollywood film directed by Aravind Sen, starring Dreamgirl Hema Malini and superstar Amitabh Bachchan. Pran played a pivotal supporting role in the film and is fondly remembered for the song “Hum Bolega To Bologe Ki Bolta Hai” sung by Kishore Kumar which went on to become a rage throughout the nation. Rare and very collectible, old hand painted Bollywood poster of the Hindi film Kasauti (1974) for sale. This is an actual surviving vintage movie poster of the 1974 Hindi film that featured the greatest superstar of Bollywood, Amitabh Bachchan in the lead role opposite Dreamgirl Hema Malini. Printed and circulated during the first release of the film (somewhere in the mid 1970s), this movie poster was printed for publicity of the film but never ended up being used. This old Amitabh movie poster was originally designed on a hand painted canvas by one of the finest Bollywood poster artists/painters called Parchure, the owner of Pamart Design Studio in Mumbai. 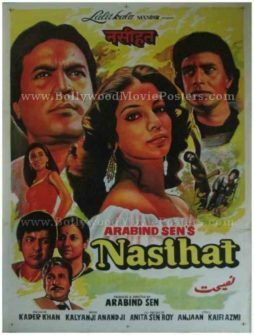 Bollywood movie poster artist Parchure’s original signature (in the name of his studio) is clearly seen on the bottom right of the poster. The poster displays stunningly accurate portraits of actors Amitabh Bachchan, Hema Malini & Pran, which is typical of Bollywood poster painter Parchure’s mastery. This old Bollywood poster features a large hand painted close up portrait of Dreamgirl Hema Malini. Superstar Amitabh Bachchan is depicted holding a gun at the back, whereas Pran is seen holding a Nepali Khukuri or a machete styled knife at the back. Old vintage Bollywood movie poster of the Hindi film Kasauti (1974) for sale. This is an actual surviving publicity poster of the 1974 Hindi film that featured the greatest superstar of Bollywood, Amitabh Bachchan in the lead role opposite Dreamgirl Hema Malini. The vintage movie poster features a still photo of Dreamgirl Hema Malini wearing a suit and a hat. A large cut out face of Amitabh Bachchan appears alongside. Pran is also seen in a still photo paste at the bottom.